One of the best parts of being TheBluesBlogger is the info I receive regarding artists I may not be too familiar with. 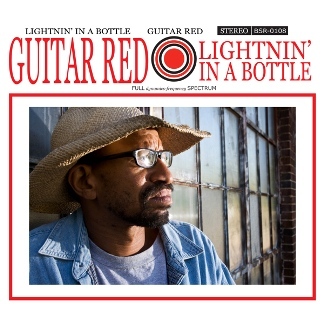 Some of them are real gems, which brings us to Lightnin In a Bottle, the upcoming release from Guitar Red. One day I woke up and realized it wasn’t so bad being Guitar Red after all,” Red muses. “When you find yourself it is the greatest gift. You just know where you are going. The one thing you will find with TheBluesBlogger is that I’m not a traditional music reviewer. I don’t analyze every note and pick things apart. I want the music to wash over me naturally and if things get me tapping, make me smile or if I drift off in thought, then that’s what makes it for me. Red’s work here is raw, but refreshing at the same time. As I continued on my journey down the road, there were several tunes that caught my ear. Songs such as Decatur Boy Blues, Lips Poked Out and of course the song that leads the rest of the album Box Car Number 9. (You can hear this selection at the top of this post.) Most of the tracks on Lightnin In A Bottle were recorded live at Backspace Records from August-December 2007. I really enjoy the vibe and groove that Red creates on this album. The selection of tunes shows off Guitar Red’s personality allowing him to play through his hardship in a passionate, playful and witty manner… My son who was dozing in the backseat of the car woke up requesting to hear the track Three Legged Dog Blues again. Of course he rambled on about the three legged dog that he sees at the doggie park in our area. This tune finally gave him a theme song to hear in his head the next time he sees or recalls that poor animal. Guitar Red is just happy playing his guitar. 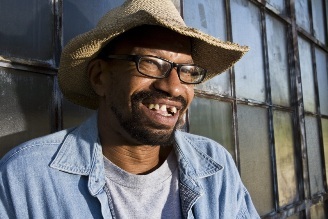 You can find him on most days in and around the square in Decatur, GA. People who are in the area can listen to Red on the street and enjoy his music free of charge. Fortunately with the release of his new album, others can now get the opportunity to hear his unmistakable sound far and beyond the square. Good Luck GR! And congratulations to BackSpace Records for having the heart to believe in Guitar Red enough to strike up a deal that has given this artist a roof over his head. This is a great story and one that I’m happy to briefly review on my site. Thanks for posting this, and for the link to his MySpace page. I like that stripped down sound that he has, a nice break from the corporate blues we sometimes here now days.